By now you have probably heard that we are throwing the party to end all parties this Halloween to celebrate VICE Magazine’s 15th birthday. This is a private affair, but we’re kicking-off a contest to win tickets to the Vice 15 year this October 31st. Winners will be notified by email and will be placed on a will call list. Lucky winners will have the honor of catching our awe-inspiring roster of performers that includes Bad Brains, The Jesus Lizard, Dave 1 from Chromeo, Peanut Butter Wolf, Nick Catchdubs, Rub-N-Tug, Blu Jemz, and Titus Andronicus & Children performing your favorite jams from ’94. All attendees must show up dressed as some sort of a cultural cliché from 1994 or risk public humiliation and denial of entrance. 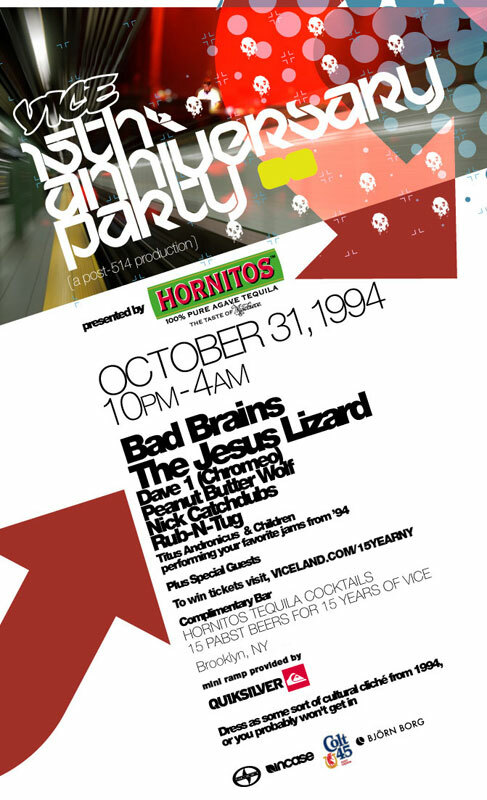 The 15 anniversary party presented by Hornitos, runs from 10pm to 4am with a complimentary bar provided by Pabst and Hornitos, and an indoor mini skate ramp provided by Quicksilver.